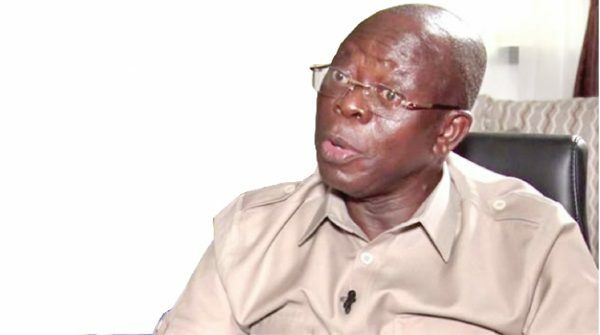 The National Chairman of the All Progressives Congress (APC), Comrade Adams Oshiomhole was on Channels TV recently, where he gave an insight on why the party’s presidential candidate, Muhammadu Buhari will win Saturday’s presidential poll, insisting that his party was glad to have former Vice President Atiku Abubakar as PDP’s candidate. How do you see the controversy over removal of the Chief Justice of Nigeria, Walter Onnoghen? Honestly, I don’t like dabbling into judicial matters because I have so much respect for our judiciary. But, when the PDP became the mouth-piece and defender of the suspended CJN some of us became worried. This is a judicial officer who agreed that he erred when he did not declare some of his assets. And we have a situation whereby huge amount of foreign currencies were found in different accounts. And the PDP became the mouth-piece of the CJN and they created the wrong impression before the International community and we saw joint statements condemning the action of the President who was acting on the recommendation made by the Code of Conduct Bureau. Are you saying that if a crime is committed on an election day and because it was an election day the person concerned should not face the law? The President of America today is being investigated over allegation of alleged Russian interference in America election. And we saw years ago when some parliamentarians in the UK resigned when it was discovered that they spent some funds they were not supposed to spend. So, I don’t know why a President who is sincerely fighting corruption, people who are supposed to encourage him are now looking the other way round. In order not to ridicule the judiciary which he took an oath to protect, I felt the CJN should have resigned honourably to avoid all these unnecessary controversies. But do you think President Buhari has fulfilled his promises to Nigerians to seek for a second term? The PDP ruled for 16 years without fixing our problems and now you are saying that President Buhari would have fixed Nigeria in three and half years. President Muhammadu Buhari has fulfilled most of his promises to Nigerians and you cannot tell me that he would have fixed the country in three and half years. We are on the road to sustainable growth and development. Our local industries are very very firm now and that is the root of the development of any country and massive investment in infrastructure which I believe President Buhari has been doing. Addressing the infrastructural issues, reviving the rail way system, dealing with the issue of power even with the way and manner that the PDP privatized the Discos, giving them to those who neither has the capacity to run them nor the resources to invest. But this is not to suggest that everything is fine. If we think that we have completed our mission we won’t bother ourselves. Let me tell you, what Nigerians have always wanted is an honest leader. You can accuse Buhari of anything but you cannot say that Buhari is corrupt. Even the worst foreign leader has acknowledged that Buhari is a man of honour and integrity, no President before him commanded that kind of respect, not even Obasanjo. And when the British Prime Minister had the guts to say, Nigeria is fantastically corrupt, our President said but you are the custodian of the corrupt money, return the money to me. How many presidents can look at the British Prime Minister’s face and say that to her, but he did. So, I am not suggesting that those who are going to vote for us think that the problems are solved, they see honest intentions by the President and he is pursuing honest solutions. People are saying that your party will not win Southeast and South-south, they will not win in the North Central and they will balkanize the votes the President has always had in other parts of the North. And they are saying your party cannot win in a free and fair election? The campaigns have started. You can actually go round and find out what people think. And the things about choice is that no man is good and no man is bad. But when you compare one man with another, no man will compare President Buhari to Atiku, those who know Atiku and what he stands for. And this reminds me the point we need to make about foreign interest in our election, we begin to see foreign countries go beyond their bounds, more or less interfering. Right now Americans are talking about the Russian interference in American election. It is a subject of investigation as we speak. So, no country will tolerate interference. But that you provide a system to monitor and ensure that you assist countries to strengthen democracy, all of that is fine. But don’t get to a level of interference. When you hear Atiku saying, I will privatize NNPC, even if they will kill him, I don’t know why he had to add that one. Who will kill him? I am not sure how many Nigerians have money to buy NNPC, he is speaking to his Western audience. When he says he will float the naira, you know whose values he is piloting. Those are IMF agenda, float the naira. So in Atiku’s world floating naira means one thousand naira to one dollar so be it. You think he does not know what he is saying. Of course, there are countries if they have their way they want Nigeria to be perpetually under developed. Of course, he will earn more votes, you know why? Somehow, there are things I really don’t want to talk about. PDP tried to give the impression at a point, if you review some reports in the past, including some stories in the print media, there was an attempt to link President Buhari to Boko Haram. That they brought him just to make Nigeria ungovernable for Jonathan. But they changed the narrative now since he became President. There is nothing they have not said. Today, the man from the Southeast who has seen Buhari building the River Niger, it is no longer rhetoric, he did not have to change his name to Azikiwe, but he is building River Niger. He is restoring the dual carriage way between Onitsha and Enugu. He is building one connecting to Port Harcourt, there are a number of roads in the Southeast that he is doing. So those ordinary traders who ply those roads, they are going to vote for Buhari. Last time they did not vote for him. Look at the outing we had in Enugu, we can see the difference between the campaign we had in 2015 in Enugu and now. We were in Akwa Ibom, you must have seen the pictures, that is the South South where they call the safe haven of the PDP, it is no longer going to be so. But some will say that crowd at rallies may not be the true reflection of votes? What are the true reflection of votes? Social media? Let me tell you, most times the crowd reflect the true picture of acceptance of that person. Go and organize a rally and say you want to be President and see. I have ran elections, I was a governor twice, so I understand the language of the electorate. I can read the body language of the electorate, I know where we are strong and where we are weak. So, if you were to go to Kebbi as I have done, and stay with ordinary farmers who are experiencing new posperity because unlike PDP government, this President said we must eat what we produce. Atiku says he is going to renew importation, he will remove the ban on 42 items so that we can go back to begin to import tooth pick, import plantain, import Amala. He is going to export our jobs and import unemployment to the country. Because there is no miracle about job creation. What this government is doing by insisting that you prohibit the importation of rice, requires huge political will. PDP producing Atiku is the best thing that has happened to this election. The day PDP selected him, we were happy. First because he cannot plead innocence. Atiku has been in government and he was party to many decisions, he superintended over the privatization of many enterprises, he was involved in many pronouncements. He was one Vice President who was so ambitious. So his face is well known. His commitment to business and his conservative credentials are very clear, he does not lay pretense to the welfare purpose of government, he does not. And look at his language he says I will enrich my friends. I would have thought a smart politician will say I will enrich Nigerians; I will make Nigerians less poor. And don’t forget that the resources of nations, states are limited, that is why the economist talks about scarce resources. So the more you enrich your few friends less will be naturally available to the rest of Nigerians. So you are confident you might win this election? I am very confident. Try and put together various statements by PDP, you can see that PDP has already conceded defeat. Now listen to this, I Oshiomhole, I have always tried to win every vote that has been counted in my favour, PDP until this election, from 1999, with the possible exemption of the 1999 election, 2003, 2007, 2011, 2015, PDP recklessly misused the Arm Forces and the police to write election results. This is the only time that the PDP will be going into an election without being in control of the Armed Forces and the Police. So they will have to win every vote. And if you know what is going on in some PDP states where they have state governors, the way in which they try to misuse the police, it shows you they are panicking. So, I have absolute confidence that whereas I will be the first to admit that there is still a lot of job to be done, and I do have couple of ideas on couple of things that we have to do differently next time around. But I have no difficulty at all in pointing out what has changed positively for the Nigerian nation. But your party has problems in Zamfara, Rivers, Ogun and Imo states, some people will say there is trouble in your party? There is no trouble at all. First is that we got a good ruling as regards Zamfara State. The Zamfara State High Court has ruled that the election conducted in Zamfara is valid and has asked INEC to accept the result. And we have forwarded the name to INEC, so Zamfara is settled. Rivers, we are still in court and we are waiting the final pronouncement from Rivers. Of course, that is worrisome, it is a pity, we cannot blame anybody, we cannot blame the judiciary, that is our own internal problem. As for Ogun State, yes, the governor chose to sponsor his preferred candidate on another party platform, fortunately for him, the law allows him to choose who to support. Fortunately for us, the governor’s support is not a pre-condition for winning an election because he himself became governor without the support of the governor that was in office then, Gbenga Daniel. So history does not tell us that once a governor does not support someone the person does not win. I became a governor not through the support of a governor, there are many people who became governors in spite of not because governors backed them. It would have been nice for people to subject themselves to party discipline. People must recognize that in a contest it is not about powers, it is about numbers. If the people prefers someone else, as a matter of disciple and commitment to party, you have to accept the decision of the party. It is unfortunate that a governor will feel that if his own preferred candidate did not win the primaries that he will have to go and field someone else in another party while he remains a senatorial candidate of our party. It is a choice I do not have any instrument to stop them from doing that, but that does not define our victory in Ogun State. As a matter of fact, because Ogun people are very enlightened, I believe that it is not the governor that will tell them who to vote for. They will also have their views on why a governor should ask them on this election vote left on the other election vote right. The people are wiser than that, I believe we will win in Ogun State. Imo State I believe the same thing, we will win in Imo State despite what the governor is also doing there. Of course, there are challenges, it is not only in APC that these things are happening, may be they are happening now more transparently. I believe that our political future cannot possibly depend in the hands of any particularly individual who chooses to put his personal interest over and above cooperate party interest. The actions of these governors, does it amount to anti-party activities within the frames of APC laws? It is about taking your time and getting your priorities right. At the eve of election I am not going to be distracted to sit down and begin to do intra-party trial. I rather take my message direct to the electorate because my focus is to win the next election, why will I waste my time on such issues. But let me remind you, if you don’t appreciate it, I am already in history as the only chairman of a governing party who has had the guts to enforce the rule and disqualify two sitting Ministers because I was convinced that they have done some things that are not in line with progressive politics. And we disqualified them even as sitting Ministers. And even the fact that the party can stand for a candidate that is not backed by a governor. It is a statement of courage. If you don’t readily appreciate that, I do since you are suggesting that I am probably afraid of disciplining them because they are governors. I am telling you, you have to decide whether at the eve of a major electoral contest, whether you want to devote your time to distractions. Go to set up panels to try them because there are procedures for discipline, or you rather devote your time talking to the electorate who are our ultimate employer. I will rather devote time and resources now, talking to our electorate in Ogun State on the need to vote Dapo Abiodun as the next governor of Ogun State and also talking to Imo State people on the need to vote Senator Hope Uzodinma as the next governor of Imo State. That will be more productive to me than dissipating energy in sanctioning the two governors now. The president’s body does not speak, the president’s mouth speaks and my ear hears. Mr President has spoken loud and clear, if you monitor the interview of Mr President, I believe on Arise Television, where he said how can any one man including a governor sit down and say, you will be governor, you, you will be deputy governor, you, you will be Speaker, while you, you will go to the House of Reps and I will go to the Senate and you said that is consensus, the President said the party has been very fair in our decision. Do you require any further comment to tell you what the President thinks about such people? But Mr President is very liberal, he has the exceptional capacity to listen and to receive any one who claims they are supporting him. And like he said in that interview, I can only hope that when people say they are supporting him that they mean it. However, he is very clear he has only one party, the APC, he supports only candidates fielded on the platform of the APC. He has stressed that many times, I don’t think he needs to say more. The issue of body language, why do you talk of body language when the spoken word is there. So, I can tell you authoritatively that in Imo State we will win more votes and our candidate Senator Hope Uzodinma will win. But should you lose the presidential election what will you do? What do losers do? Let me tell you, anybody that knows me will tell you, I fight hard for what I believe in, but I don’t play god, I am a democrat. When I tell you that Nigeria is bigger than the subtotal of all the political parties it comes from my heart. Or I tell you that if there is conflict between my conscience and my privileged position, I will resolve it in favour of my conscience, it comes from my heart. And those who know me knows that is the way I am, I fight hard, but I don’t play god. See, if Saraki convenes the Senate tomorrow and we have the number we will impeach him because we cannot accept that minority will rule the majority. And I am happy that he has renewed the fight. There was an informal understanding between him and his colleagues in the APC that he was going to put the national interest above his personal interest, so somehow there was a cease fire between him and our APC senators. But right now that he is trying to reduce the senate to a department of the PDP we have to impeach him. We cannot accept different standards, democracy has only one definition. In order to avoid distractions, we did not want to go to court, otherwise when you decamp from a ruling party to a minority party you have to forfeit your position. We have the number. We have two-third to remove him. The mistake people make, go and read the constitution very well, the constitution says to impeach a President, Vice President, you need two-third of all the members of the senate. To impeach governor and deputy you need two-third of all the members of the state House of Assembly. And it goes on to say to impeach the Senate President you need two-third of members, he did not say of all members, it means members seated on that day. So any time that Senate sits and we have the two-third, we will sack Saraki, he will be impeached. We will sack Dogara, they will be impeached so that we will protect our democracy, our democracy is bigger than Saraki. Is this a democracy or a demonstration?. The barbaric political culture of Nigeria since 1999 was only a demonstration of political indiscipline, political unsound mind and total lacked of political maturity where senselessness, foolishness and poor political ideology prevailed over wisdom and common sense. The National Chairman of APC, Adam Oshiomole should realizes that he cannot manipulate Nigerians by being bias and judgemental on the matter of former vice President and presidential candidate of PDP Atiku Abubakar whom was former presidential candidate of the then ACN in the 2007 presidential elections of which the records were cleared from the way the then ACN strongly campaigns for Atiku presidency by presented him as a saints and Messiah so are they not aware of all the issues that are now unfolded in the name of campaign against Atiku or do they think Nigerians had forgotten? The questions to ask Asiwaju Tinubu remained that “You can fool some people sometimes but You can fooled all the people all the time” The way and manner APC are campaigning all over the country only showed an unwarranted transfered of malice to many people in their desperate to win election especially Chief Olusegun Obasanjo because would dwelling on the past Government becomes the only excuses for failure to ensure security of lives and properties? Dwelling on the past government as the cause of problems in the Nigeria political culture cannot be an excuse nor an issues as far as democracy is concerns however Tinubu, Oshiomole, Ameachi and their allied should stop labelled Former President Olusegun Obasanjo that he was behind the problems of power sector in the name of campaign since neither ICPC nor EFCC charge him for corruption related case of which if the APC cannot proffered permanent solution to socioeconomic, political and security challenges of the country they should democratically step-out. Allowed much dwelling on the past government without derives reasonable lessons of its mistakes, areas of achievement, common leadership error and possible areas of political success showed that the present government would not achieved anything but only created baseless commotion in the name of achievement. To Asiwaju Bola Tinubu, Is Alh. Atiku Abubakar a Saints or not?. What made Atiku a Saints in 2007 ? While now is otherwise?.